Camp site badge for Waddecar Scout Camp (West Lancashire) Where the West Lancashire County Office is sited. Badge designed by Andy the camp manager not that long ago. 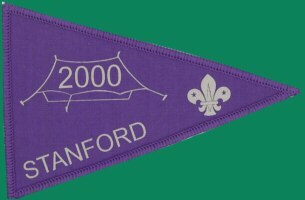 Ties in nicely with Area badge as it depicts trees, hills, water and tents. Excellent souvenirs!! This badge was issued in 1996 to selebrate 10 years of Beaver Scouting 80 years of Scouting and 50 years for Hesley Wood Camp site and South Yorks HQ.